We’ve had very little rain for the last couple of months, and the ground’s dried out again very quickly even after a whole day of it. We’d never claim to be a ‘drought garden’, but we do try not to use more water than we really need to. Even in this very dry summer we haven’t (yet!) had to use the hose this year, but the gardens don’t look particularly dry. This is thanks partly to the amount of mulching we did last year (putting leaf mould or compost on top of wet ground to hold the moisture in), and partly due to our choice of plants – garden perennials and many wild flowers need much less watering than annual bedding plants, for example. We use watering cans for a couple of weeks when we move plants or put new ones in, to get them established, then mulch them well and leave them to get on with it. The exception is the vegetable bed where the children from the local preschool are growing peas, beans and carrots this year, where we’ve been using the watering cans a lot, particularly before the children broke up for the summer – they love watering things, and the runner beans probably had such a good start that they’ll survive any number of dry weeks now! The mulch used for the bottom two beds (nearest the war memorial) last year was a proprietary compost made from wool and bracken, which has also kept weeds down for over a year and is still making a difference. We’re just beginning to notice a few weeds creeping back now, but it’s saved us a lot of time. It forms a bit of a crust, which does make the soil quite hard to work in the second year, so we haven’t used it this year in the other beds where we’re still moving a lot of plants round; there, we’re using garden compost round individual plants that need more feeding, or leaf mould where we just want to cover the ground over the winter, which is better for the soil. We’ve noticed a lot of ladybirds and other predators rooting around in it, which is good as we want to encourage them as much as possible around the gardens – this year they did a great job of seeing off any aphids that did try to colonise the plants!. It’s a difficult balance at the moment – if we cover too much of the ground too early on, we’ll stifle all the self-sown Californian poppies, cornflowers and others that we’d welcome, but this is exactly the time when a lot of weeds start germinating, and we don’t want our volunteers to have to keep weeding the same patch again and again. 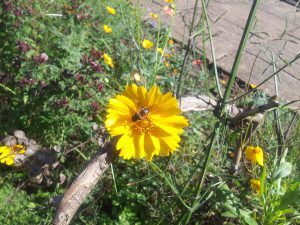 This entry was posted in Uncategorized and tagged drought, insects, leaf mould, mulching, preschool, vegetables, watering on September 13, 2016 by foe.